What Advantages Do Aftermarket Suspension Components Offer? Most modern cars’ and trucks’ suspensions are carefully designed to ensure adequate performance under a variety of conditions. Still, every suspension represents numerous compromises, as manufacturers must design their cars for a variety of needs and conditions while ensuring that most customers’ expectations about ride and handling are met effectively and safely. And of course cost matters, whether the manufacturer is charging fourteen thousand dollars for a Kia or two million for a Koenigsegg. But your needs — and budget — may not match what the manufacturer had in mind for his or her particular model, and in that case you may consider upgrading the suspension with aftermarket parts. Suspension components — OEM (original equipment manufacturer) and aftermarket — vary so much that there’s no single answer. Instead, it makes sense to consider suspension modifications individually. Tires: Tires are part of the suspension, and changing tires can have a surprisingly significant effect on handling, roadholding in various conditions, and even ride. Some tires offer dry “grip” that’s superior to the OEM choices, others offer tremendous improvement in winter conditions, and it’s even possible to find tires that give a quieter and more comfortable ride or improved fuel economy. In many cases, the main tradeoff is that the best tires wear out fastest. Wheels: In contrast to tires, wheel choice is usually an aesthetic decision. In theory, a larger wheel and correspondingly lower-profile tire can improve handling but in practice, the effect is minimal or nonexistent. Some aftermarket wheels offer weight improvements but many are actually heavier, not lighter, than stock. Camber kit: Drivers who have installed aftermarket wheels with increased offset, meaning the tires project farther from the car, often find that the camber (wheel tilt inward or outward) is adversely affected; installing a “camber kit” may allow correct alignment. Shock absorbers: Aftermarket shocks can offer improved handling at high speed or (particularly for trucks and SUVs) when driving in very rocky or bumpy conditions. Some aftermarket shocks are even adjustable, so the owner can fine tune the ride to his or her liking. In general these adjustments require changing something (such as turning a dial) under the car, but a few are electronically adjustable from the cockpit. High-quality aftermarket shocks may also be more robust than stock. This doesn’t matter very much for cars but is a significant issue for off-road trucks. Bushings and joints: Replacing soft rubber bushings with stiffer ones, sometimes made of nylon, reduces the “play” between suspension components, which can mean improved road feel and sometimes handling at the limit, at a cost of increased vibration and harshness in the ride. Sway bars: Installing a thicker and therefore stiffer sway bar, often with more rigid bushings, can improve a car’s handling by reducing its tendency to lean to the outside of turns. Matching the front and rear sway bars can also change the the car’s tendency to “oversteer” or “understeer.” The main downside is reduced comfort and sometimes roadholding in bumpy conditions. 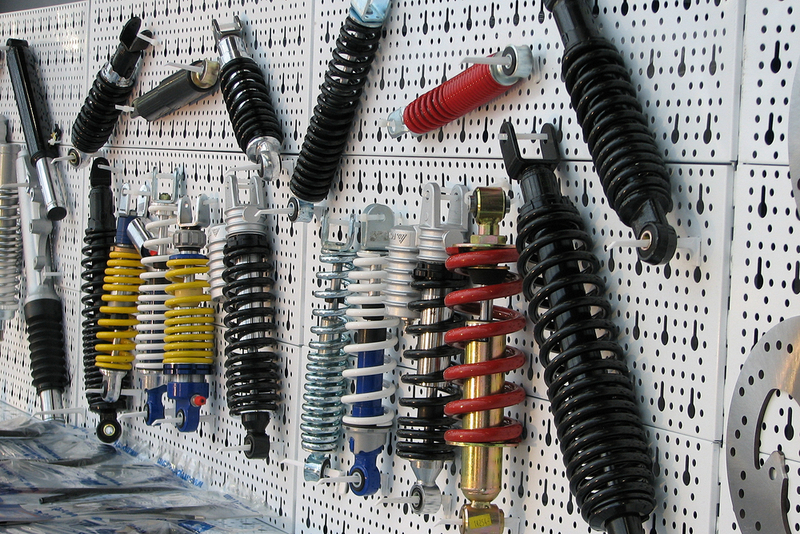 Springs: Aftermarket springs are often part of complete suspension kits or at least paired with new shocks. Replacement springs may be either stiffer or softer than stock; stiffer springs can improve handling under racetrack-like conditions at a cost in ride comfort, while softer springs might be employed to improve an off-road vehicle’s ability to traverse rough terrain. Lowering kits: Some drivers install aftermarket “kits” to lower their car’s ride height. These kits take varying forms, and may include new springs and spring mounts, new shock absorbers or struts, and sometimes even hydraulic (fluid) or pneumatic (air) systems that allow the driver to change the height while driving. In theory, a lowered car may handle better, more safely, and be somewhat more aerodynamic, but in practice many drivers also prefer the appearance of a lowered car. Lift kits: On the other hand, some owners want to raise their truck’s ride height, usually to improve their performance off road. A raised or “jacked” truck can also use larger tires (sometimes much larger - some monster trucks have tires that are ten feet tall), but the primary advantage is increased suspension travel, meaning the wheels can move up and down farther as the truck travels over bumps. Kits intended for serious off-roading include new springs, shocks, and various other parts such as steering stabilizers, all designed to accommodate the increased suspension travel while holding up to harsh, extremely bumpy conditions. Coilover kits: A coilover, or coil-over-shock, kit replaces much of the car’s suspension (almost always in the front, and often at all four wheels) with a coil-over-shock variation on a MacPherson strut design. Well-designed coilovers offer improved high-speed handling and a reduced and often adjustable ride height, sometimes without appreciably harming ride quality, and are therefore highly prized by those who occasionally race their cars. As you can see, aftermarket suspension parts may offer a variety of advantages. Choosing the parts or kit that is best for your needs is critical, as many “advantages” may not matter to you, and every suspension change involves tradeoffs. What are the advantage of aftermarket suspension parts? Aftermarket suspension components can range from relatively simple parts such as more rigid bushings to complete suspension overhauls, including lift kits and coilovers. The advantages vary depending on the parts involved but in general for cars, the goal is better handling at high speed (at a cost in ride quality) and sometimes adjustability, while for trucks it’s increased ability to handle very rough terrain. Q: What Are the Drawbacks Of Lowering My Car? Q: When accelerating from stop, rear end hops.